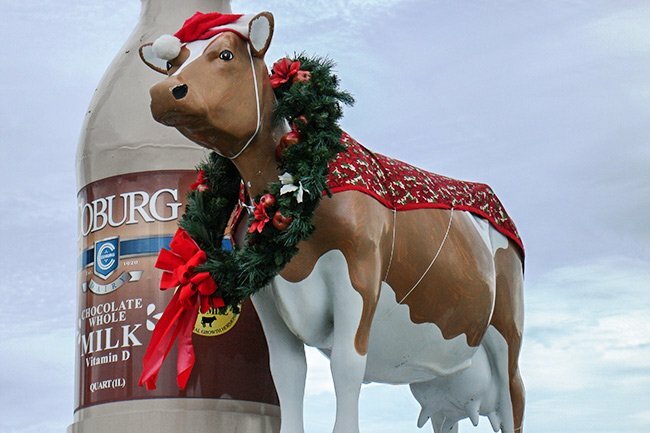 This holiday season, join us as we celebrate the Holy City's historic Coburg Cow. The beloved bovine – often called Bessie – spins beneath a giant neon "C" on Savannah Highway in the West Ashley area of Charleston. This year was an especially busy one for Bessie, as she had to be taken down and stored during the stressful hurricane season. Erected in 1959, the Coburg Cow has earned her spot as one of Charleston's most famous landmarks, and even though Coburg Dairy is now owned by Borden, Bessie still smiles down on drivers hurrying below, serving as a happy reminder of a slower, simpler time. Bessie is particularly well-known for her sense of style, and during the holidays, she sports a red and green cape, a Santa Clause hat, and a wreath around her neck. No slouch in other seasons, Bessie also wears a cap and gown in May for graduation, a bonnet at Easter, and a white sheet for Halloween – complete with two holes cut out for ghostly eyes! The bottle of chocolate milk that stands by her side weighs 150 pounds and is sometimes replaced by eggnog at Christmas. You can see more photos of Charleston's Coburg Cow – in all her costumes – at the South Carolina Picture Project. Feel like celebrating this winter? Look no further than SCIWAY's SC Calendar of Events, where you will find holiday activities across the state. Enjoy holiday classics by attending a local concert, watching a performance The Nutcracker, or visiting a holiday craft fair. Worried about those extra winter pounds? Then register for a race or test your balance at a seasonal ice skating rink. South Carolina offers an abundance of fun this season, so start planning now! Looking ahead to the New Year? 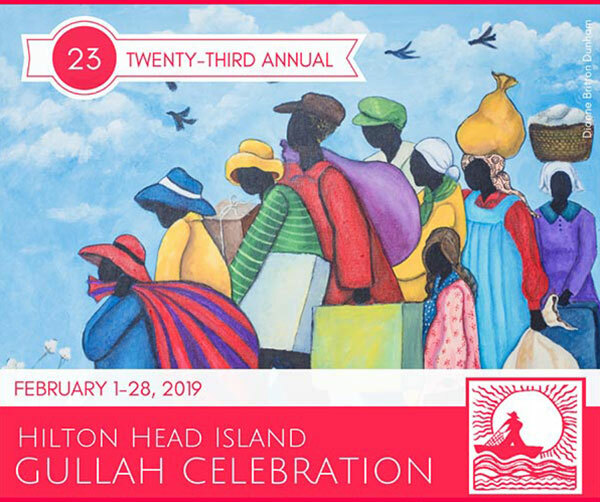 Each February, the Hilton Head Island Gullah Celebration showcases the rich cultural heritage of the Gullah people and their history. Recognized by the Southeast Tourism Society as one of the Top 20 Events in the Southeast, the event attracts local residents as well as regional, national, and international travelers. Visitors have an opportunity to experience Gullah art, crafts, and food – including the Taste of Gullah celebration feast!– as well as live demonstrations, traditional storytelling, gospel music, and soul-stirring spirituals. 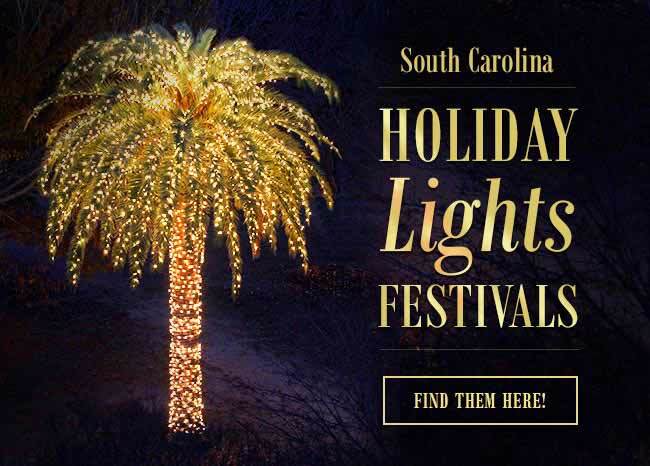 The twinkling of millions of lights across South Carolina signals the start of the holiday season. From neighborhood Christmas light displays to large, drive-thru festivals hosted by governments and nonprofits, our state's winter nights are illuminated from mid-November through the New Year. Use SCIWAY's guide to find SC Christmas lights near you! This year, give local gifts from South Carolina authors, artists, cooks, craftsmen, and farmers. Shop online for original SC paintings and photographs, books, gourmet food, palmetto-tree clothing, gift baskets, and more. Use our guide to Palmetto State Gourmet Food & Gifts to find the perfect gift for giving – or keeping! Specializing in original impressionistic landscapes, abstract paintings and pet portraits. Please visit Portfolio Art Gallery for current works or call to schedule a gallery tour. Commissions by appointment. Meet Wrenny the Carolina Wren, Berks the Barking Tree Frog, and Shrimp n' his buddy Grits! These and other fun "critter pins" come in the shape of the South Carolina, and they are perfect for keepsakes and gifts! These three hardback books feature the unlikely friendship that develops between two young river otters, Flash and Fancy. The story is told in the gorgeous setting on Sandy Island along the Waccamaw River of coastal South Carolina. McLeod Farms Market – located in the Pee Dee – offers gift baskets filled with Southern favorites like grits, fresh seasonal fruits & vegetables, and bakery goods. McLeod Farms offers a variety of items to be enjoyed year-round. Customized wine and food gift baskets from Charleston, SC, made with Southern Style! Filled with packaged and homemade treats from our gourmet deli, Carpentiers Wine and Dine. Design your basket online by selecting from over 200 gourmet foods and fine wines, or choose one of our standard designs for any occasion. Same day and corporate design services available. Local deliveries and nationwide shipping! Feature your SC gift on SCIWAY and in future newsletters! If the upcoming festivities have you feeling a little frantic, take heart! SCIWAY has a wealth of resources to help you through this hectic – but happy – holiday season. Don't torture yourself! Make this season's feast as easy as pecan pie with your very own caterer or personal chef. Discover places where you can cut your own Christmas tree, plus tree care tips and info on living trees. Find out where you can share the spirit and meaning of the season with others. 'Tis the season to give! Learn how you can help the nonprofits working in your community. From the Lowcountry to the Upstate, everyone's showing their spirit! Where to send the in-laws. Umm, we mean, great guide for friends and family members in town for the holidays! Thousands of South Carolinians are cold and hungry this winter. Learn how you can lend a helping hand. Too many cooks in the kitchen? Find out where to get a good meal. Warm up this winter with a hot cup of tea, and don't forget to treat yourself to a scone! 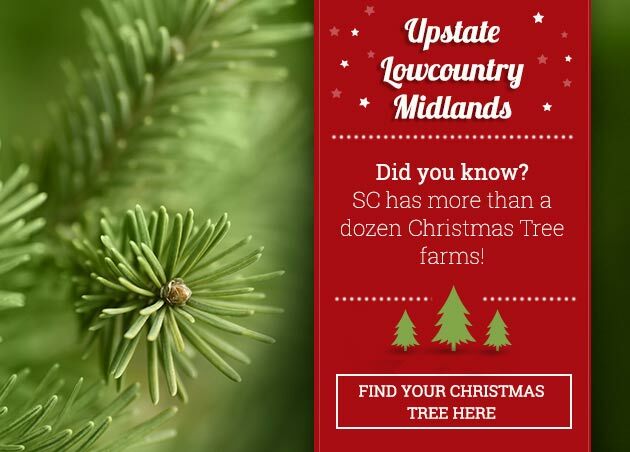 Christmas trees are grown in South Carolina from the Upstate to the Lowcountry. Cypress, cedar, and pine varieties are most common in our state. Some farms in the northern reaches of SC also grow fraser firs. Although most of the state's climate doesn't support the growth of firs, many local Christmas tree farms receive regular deliveries of fresh fraser firs. Find your perfect Christmas tree here!